"Harry Styles: Why Masculinity Doesn't Make the Man" is easily the most read article I have ever written (thanks to Ms. Twist for the boost). Published close three years ago, I wrote the piece months after attending a One Direction concert with my partner in my home state of Indiana, a place known better for its race car driving and bigoted cake bakers than much else. In the past three years I have driven over 2,100 miles, accompanying my girlfriend to shows across the Midwest and I have to admit that I am amazed by the devotion, compassion, and inspiration that has followed Harry Style's career. Side-stepping from his success as one fourth (or fifth) of One Direction, Harry Styles took a daring leap into a solo musical career. Releasing a cover of "Girl Crush" along with numerous performances of Fleetwood Mac's (read Stevie Nicks') The Chain, Harry Styles ended 2017 with 19 sold-out solo performances under his undoubtedly elaborate belt. While we've seen success turn ugly for many in the public eye, it seems to have a rather humbling effect for this gentleman. Soon finishing the 57 performances announced for 2018, Styles has taken nearly every opportunity to build his fans up and the communities to which they belong. Following Kasey Musgraves' opening act including "Rainbow" and "Follow Your Arrow" with lyrics such as "kiss lots of boys or kiss lots of girls if that's something you're into," Styles dances on stage with Black Lives Matter, lesbian, bisexual, and trans pride flags, carving out safe spaces across the United States regardless of local attitudes. Quite honestly, a Harry Styles concert contains as many pride flags as a San Fransisco pride festival and as many flared pants as a sweaty 70s Studio 54. And sure, he waves the flags, reads the signs, and doesn't change the pronouns in songs to fit the heteronormative culture that runs rampant in the music industry, but his efforts are much greater than serving as a jumpsuit-wearing flag cadet. One of the best things I've learned that we as human beings can do for one another is to be ourselves and to support others. That means wearing the clothes, being who you are, and using your privilege to help create a space for others to do the same. This also includes speaking up against racism, ableism, classism, homophobia, misogyny and other violent stances born from places of fear and hate that keep our fellow humans from living happy, safe, and respected lives on this planet that we all share. Before millions, Harry Styles has modeled self-acceptance and pride via custom suits and a playful spirit that David Bowie and Freddie Mercury would most certainly be proud of. His glittered jackets, flared pants, and hip-forward interactions with fans embody the love that is lacking in so many spaces we encounter on a daily basis. In a world of toxic masculinity, bigotry, and self-absorption, thoughts and prayers fall short. Public love for self and others is what the world needs more of because when we love ourselves and others we act on that love. We protect those that we love, we have their best interests at heart, and we never stop fighting for them. Of course there is plenty more that can be done but Styles has made visible what every single human being is capable of regardless of privilege or belief: kindness. Headlining a tour featuring a George Michael infused "Anna" and "Medicine" a song which shamelessly declares "the boys and the girls are here, I mess around them, and I'm okay with it," Harry Styles' endorsement of kindness grows far more explicit. 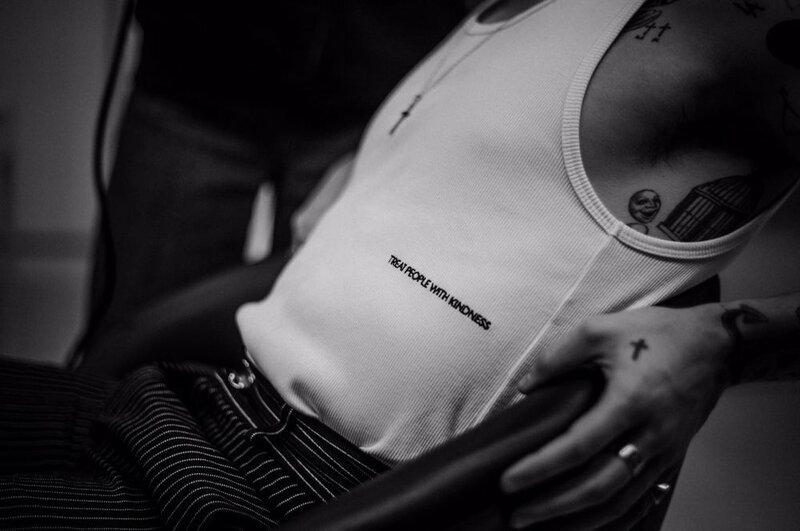 A "Treat People with Kindness" (TPWK) motto has followed Styles' tour as a perpetual reminder that we all can do better. We can be nicer to the person at the check-out counter, we can be kinder to ourselves, or in the very least we can be reminded that every single person has value. While some may take issue with Styles politically aware, incredibly successful shows, they can't possibly be looking at the faces of the thousands who have flocked to those stadium venues. They must not be watching as marginalized communities are affirmed, acknowledged, and loved so deeply by a man who knows nothing but their very existence- and he's thankful for it. That's all it takes. So do everyone a favor- be kind, be boldly you. Ashleigh Bingham better known as “Bing, ”creator of I Dream of Dapper, is a dapperwear Tumblr style icon. She contributed to popularizing the long-haired "queer pomp" and is known for her daring pattern mixing, complimentary rich colors, lapel pins, wild thrift finds, variety in neckwear (featured in her "50 Days of Dapper" project), & ability to write about Harry Styles. In the past, Bing has contributed to Autostraddle, and has been featured on DapperQ, S Moda, Hudson, Buzzfeed, and included in the top 10 of a national menswear online competition. With a tendency to mix fashion with satire, Bing aims to explore fashion as a tool for self-expression rather than an industry. Sep 2 Nonbinary Black Tie Event in Hong Kong, How to Avoid Being Gendered, and More!